Cherry season. I love eating breakfast in the summer. The fresh fruit choices are amazing and make eating breakfast fun. 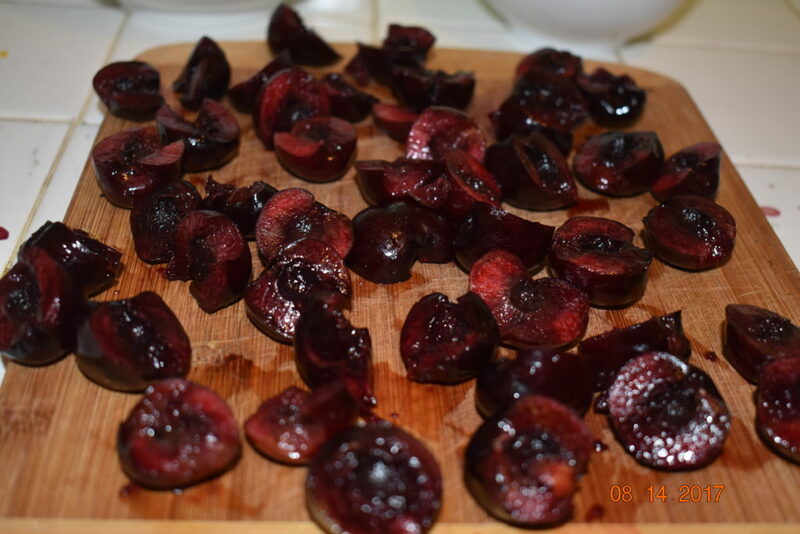 Also, one does not usually have to cook fruit – so good when you’re trying not to heat up the house at this time of year – just a quick slice here and there to remove any pits and your cherries are good to go. 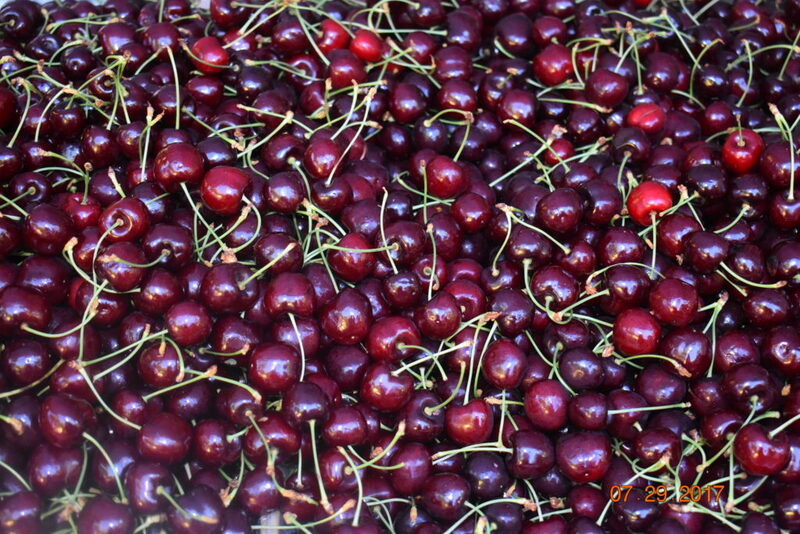 When I see cherries my mind often goes to the saying “Life is a bowl of cherries.” When you see cherries in a bag, in a bowl, in a big container at the market, you smile, don’t you? Originally this sentence is conveying the sense of goodness, joy and positivity. 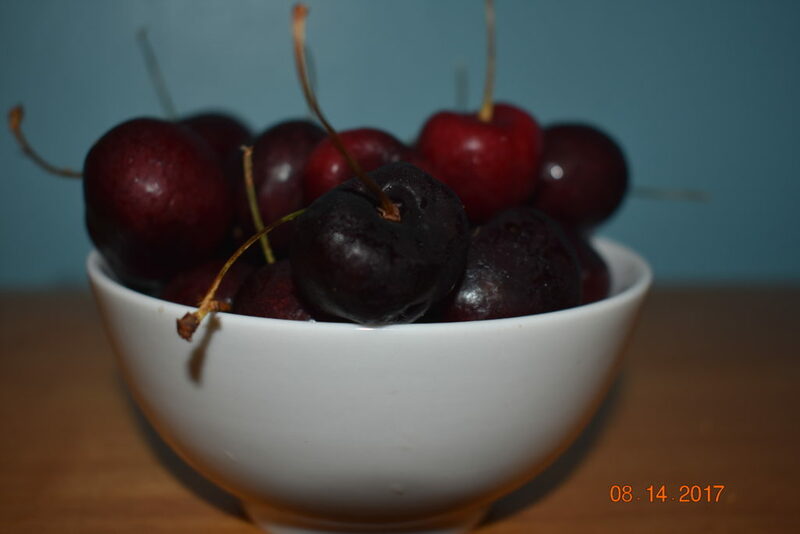 Incidentally, Life is a Bowl Of Cherries was the title of a song written in 1930. 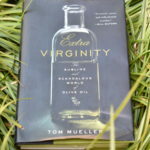 Dictionary.com has a great synopsis of it. If you are middle aged (whatever that means) or beyond you are probably reminiscing on Erma Bombleck’s book titled If Life Is a Bowl of Cherries, What Am I Doing in the Pits? That book came out in 1978. I remember it being on my grandmother’s night stand. Hard to believe dear Erma left this earth in 1996. So, back to cherries. Why are people often focused on those pits? I have to say that cherry pits are easier to spit out and can go farther than a watermelon seed. 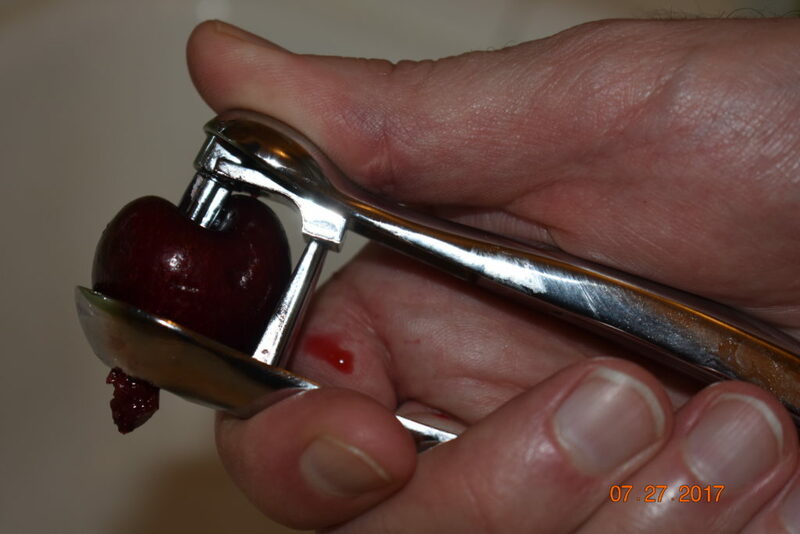 The cherry pitter, the gadget of the month, is fun to shoot the pits out of the cherry and see a juicy – albeit messy – red trail left behind. How many hours did you spend trying to tie the cherry stem in a knot with your tongue? 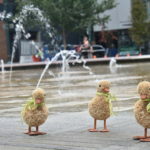 The cherry often brings to mind the silliness and simpleness in life. When using that wonderful pitter contraption, I highly recommend doing it over the sink, because all fun is gone when someone loses an eye or slips on a pit. That would be the pits. I couldn’t help myself with that line. 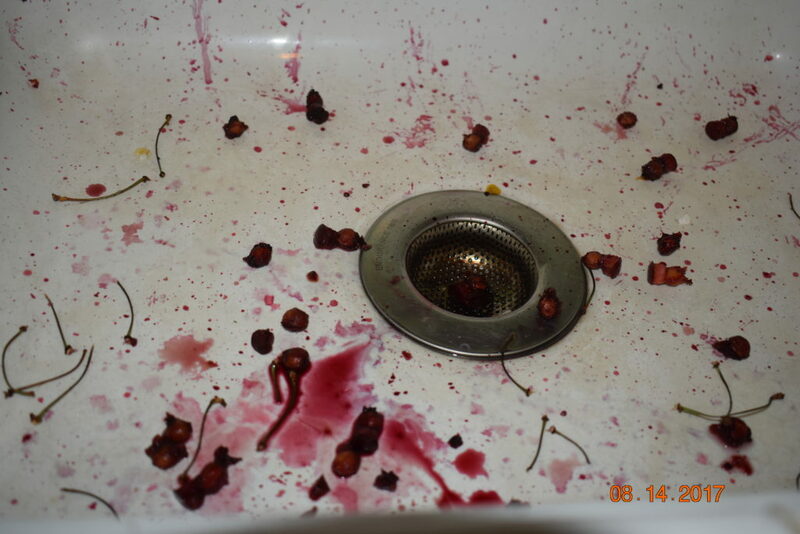 The upside of pitting cherries in the sink is that it is easy clean up. 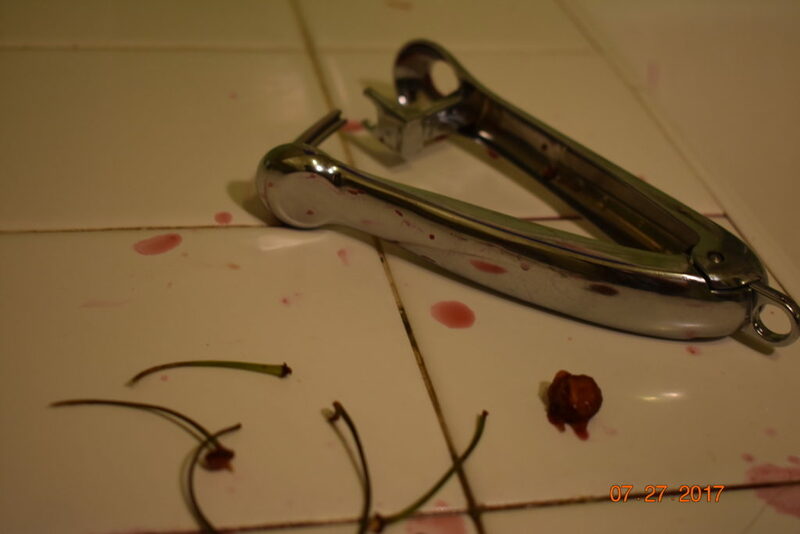 To use the cherry pitter, take the stem off and make sure you align the pointy part to the place where the stem was located. Make sure the pit comes out – don’t want someone biting into a pit. This gadget can be also used to pit olives as shown on the link above. This is another task to keep one mindful. 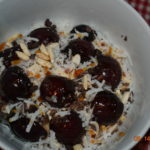 Today we are just adding these cherries to a bowl of yogurt. No oven, no stove for this recipe. Sometimes we get in a rut with accessorizing our yogurt. 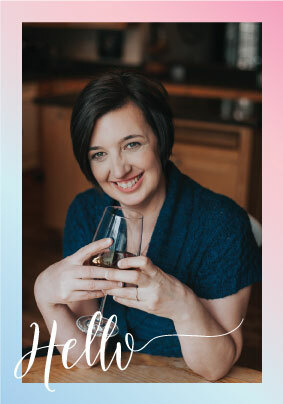 In the upcoming weeks I hope to spark your imagination to change up your morning eating habits and actually be excited to dig in to breakfast. When talking about cherries, the word or the item chocolate is often associated. So in this bowl I use cacao nibs, which in my opinion has blasted the carob chip into oblivion. One has not heard mention of the carob chip for some time. 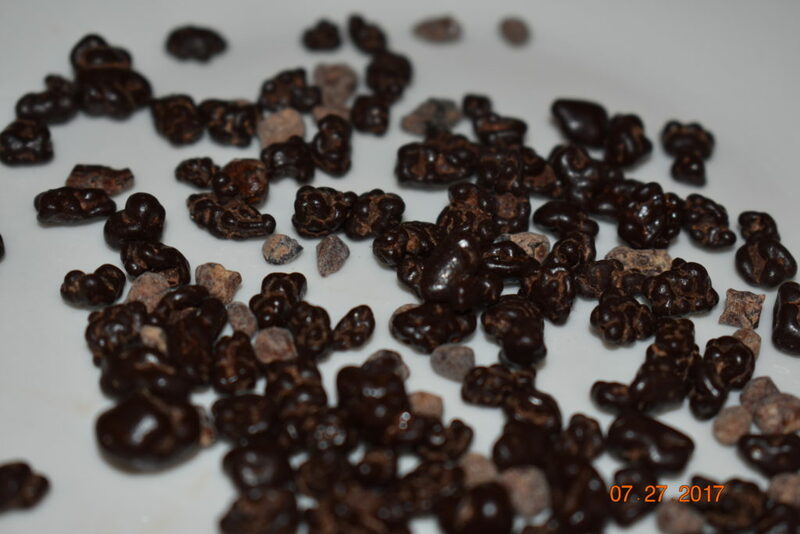 Cacao nibs are pure chocolate, from the cacao bean into smaller pieces. The Huffington Post has a great article on the cacao nib and the great benefits it has. Most stores carry them. Trader Joe’s carry them and they seem sweeter than the brand you find at other stores. I have not looked at the back of the label recently to see if they add sugar or not, so keep that in mind. Like kale, coconut can do no wrong these days. We will put a couple of tablespoons of coconut oil into our yogurt bowls today. 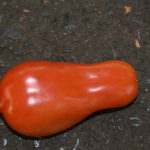 If you keep a jar out on your counter or in your cupboard, this summer you probably have seen it become a liquid form instead of a solid and you truly will not need to use the microwave or turn the heat on. This is exactly what I did. Just a heads up the oil can become solid bits in the yogurt bowl if you do not eat it right away. I have not yet found the subtleties of different brands or the difference between cold pressed and not. Sometime in the future we will have Mr. Coconut over for an interview to get all of our burning questions answered. In the mean time, I am hungry – let’s eat this filling and delicious no cook yogurt bowl! You don’t need to wait for breakfast. This recipe is great for dessert, breakfast, a snack or for dinner. It is filling thanks to the additive of coconut oil. Not sweet. Has great texture and crunch thanks to the rice puffs. Add a 1/2 yogurt to your favorite bowl. Layer the rest of the ingredients as listed above to your bowl. Drizzle with honey to your desired amount. Put a spoon in it and enjoy. 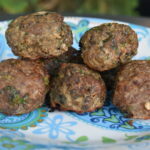 You can substitute these with amaranth or millet puffs. They are usually found on the bottom shelf on the cereal aisle of your grocery store.